By the Author of Stoner In Augustus, his third great novel, John Williams took on an entirely new challenge, a historical narrative set in classical Rome, exploring the life of the founder of the Roman Empire. To tell the story, Williams turned to the epistolary novel, a genre that was new to him, transforming and transcending it just as he did the western in Butcher's Crossing and the campus novel in Stoner. 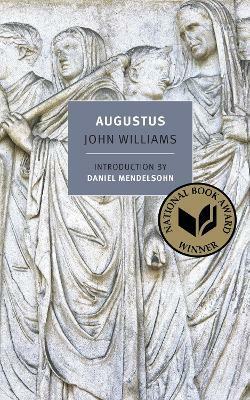 Augustus is the final triumph of a writer who has come to be recognized around the world as an American master. John Williams (1922-1994) was born and raised in northeast Texas. Despite a talent for writing and acting, Williams flunked out of a local junior college after his first year. He reluctantly joined the war effort, enlisting in the Army Air Corps, and managed to write a draft of his first novel while there. Once home, Williams found a small publisher for the novel and enrolled at the University of Denver, where he was eventually to receive both his B.A. and M.A., and where he was to return as an instructor in 1954. He remained on the staff of the creative writing program at the University of Denver until his retirement in 1985. During these years, he was an active guest lecturer and writer, editing an anthology of English Renaissance poetry and publishing two volumes of his own poems, as well as three novels, Butcher's Crossing, Stoner, and the National Book Award-winning Augustus (all published as NYRB Classics). Daniel Mendelsohn was born in 1960 and studied classics at the University of Virginia and at Princeton, where he received his doctorate. His essays and reviews appear regularly in The New York Review of Books, The New Yorker, and The New York Times Book Review. His books include The Lost: A Search for Six of Six Million; a memoir, The Elusive Embrace; and the collection Waiting for the Barbarians: Essays from the Classics to Pop Culture, published by New York Review Books. He teaches at Bard College.